We took a sightseeing tour one day. It cost £100 and included a driver as well as the tour guide – including lunch. As the car left the coastal resort areas you could see that the country was pretty poor with many buildings merely consisting of corrugated iron and tarpaulins held up with wooden props. The main roads were in good order and all the uncleared areas were jungly in appearance. We saw cows, dogs and even the odd donkey wandering by the road side. Water buffalo were tethered in yards and along every main road there were stalls selling fresh fruit and vegetables, including coconuts which the stall holder swiftly opened with a machete and inserted a plastic straw, so you could drink the refreshing contents We visited a Hindu temple and a Catholic church, the two main religions in Goa – Muslims being the third religion. Our guide said they all lived together in harmony. 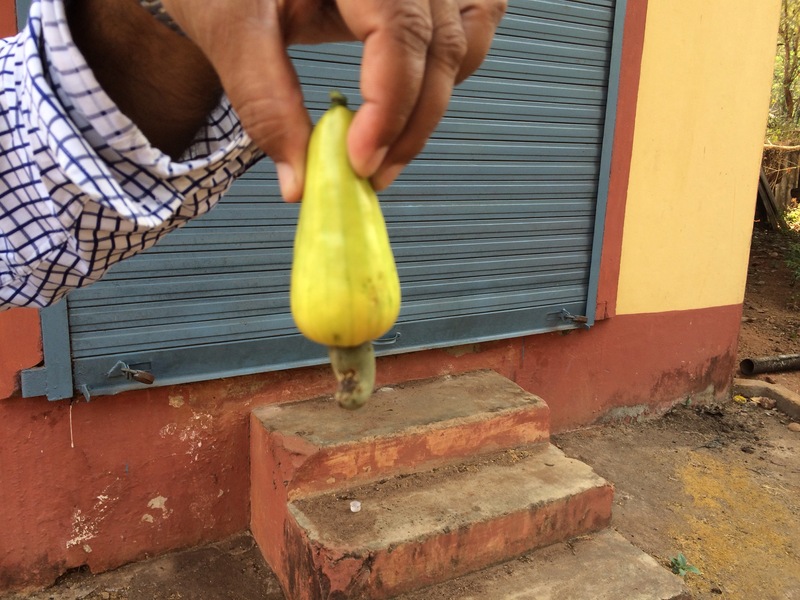 We stopped at a cashew nut factory and were amazed to see how they grew on the trees, each fruit having just one nut growing beneath it. They pulped the fruit and made it into fenni, a wicked local alcoholic drink. 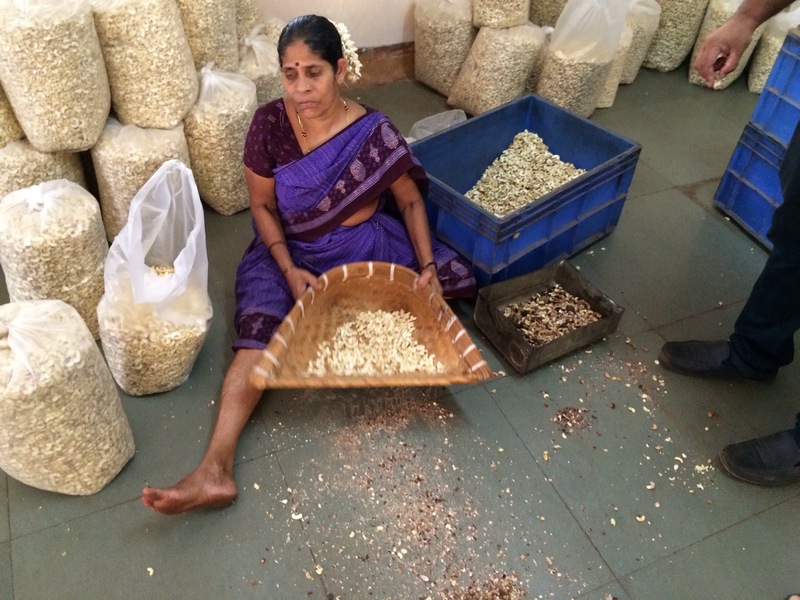 The nuts were then boiled, shelled by hand, then the skin was removed before being hand sorted and packed. 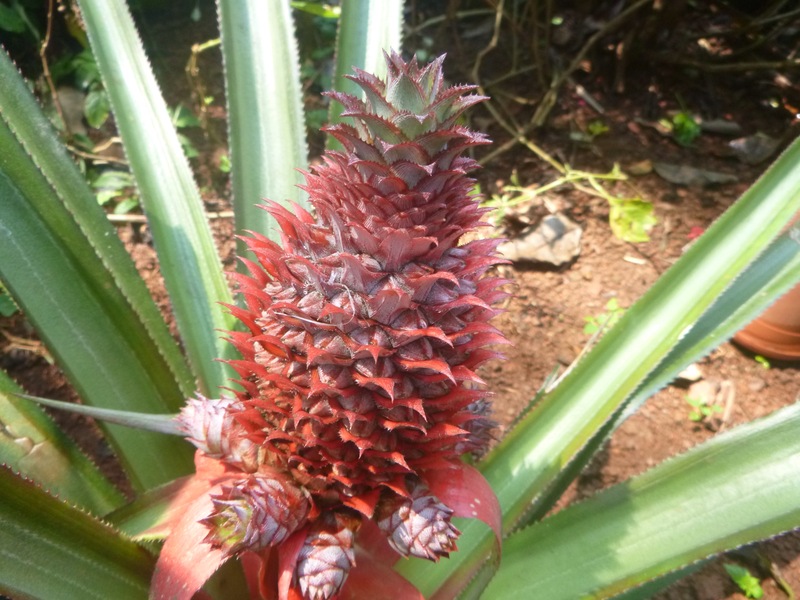 A Female Pineapple – the male has no prickles! 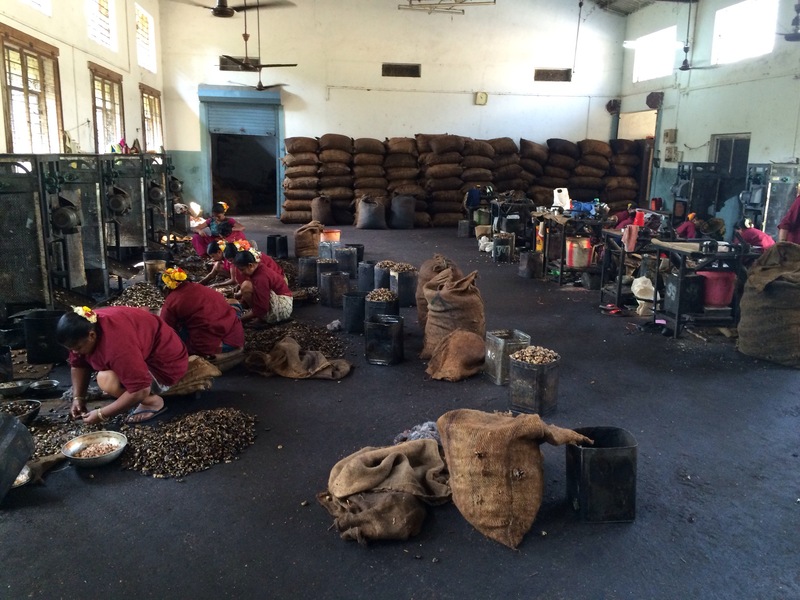 Production of spices was an important industry in Goa and we visited a spice farm and were shown the variety of spices being grown: allspice, coffee beans, cardamon, peppercorns, cinnamon, turmeric and so on. 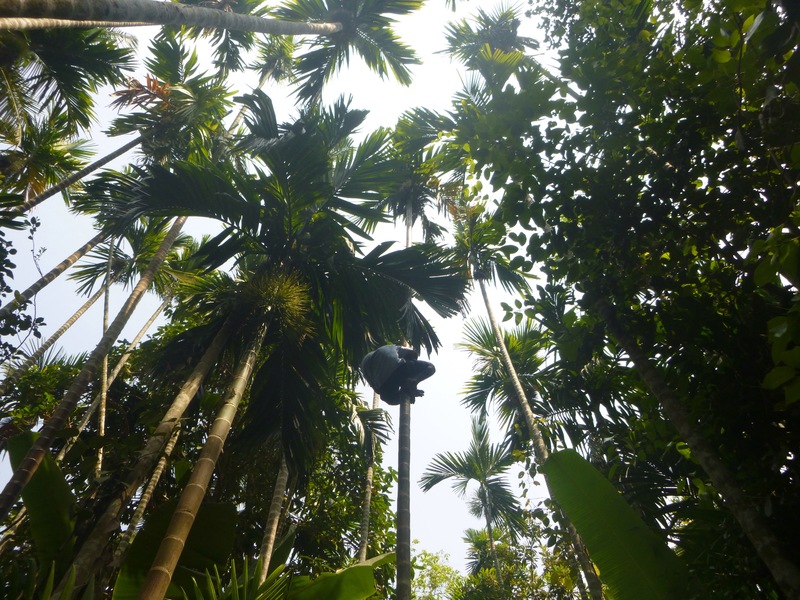 We watched a man demonstrating harvesting the betel nut by climbing a tree twenty metres high, swaying the tree toward the next one and crossing from treetop to treetop. When he wanted to come down he just jumped, slowing his descent slightly with a short length of rope held in each hand and encircling the smooth trunk. It was very hot and our guide ended the tour by tipping a ladle of chilled water laced with lavender oil down each of our backs – it was a shock but very refreshing. Then it was time for lunch served on plates made from betel nut leaves. 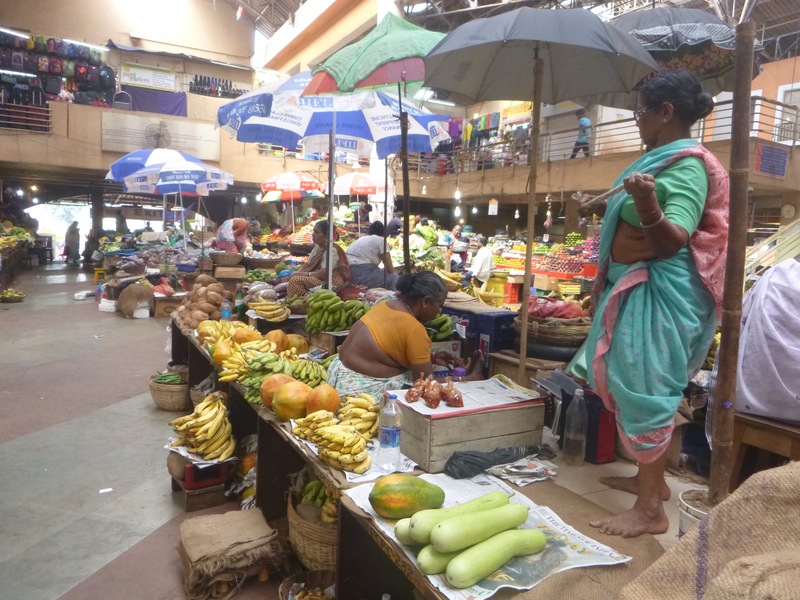 On the way back we stopped at a vegetable market in the capital Panaji. 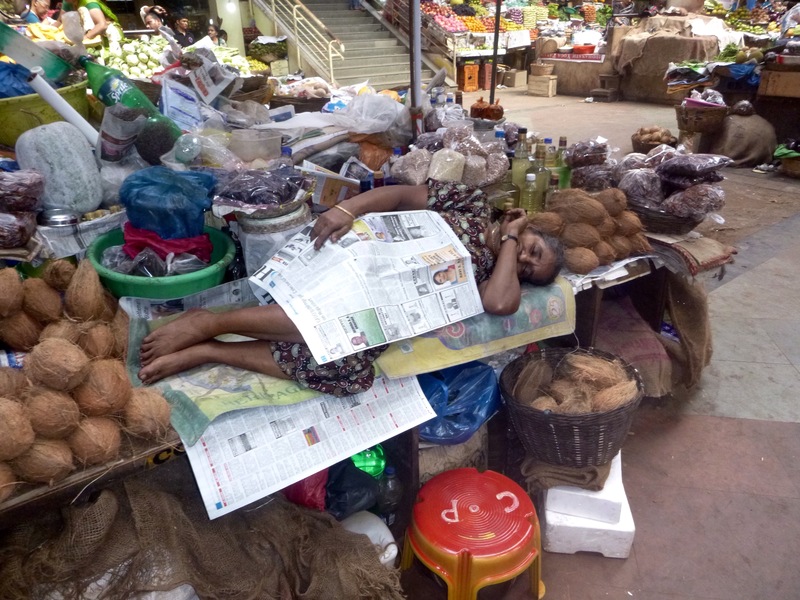 By then it was mid afternoon and some of the stall holders were eating or taking a nap. After breakfast the following day we headed for the beach. The sun was shining and it was 33° but with a cooling breeze. We felt thoroughly spoiled when hotel staff provided us with huge towels and positioned our sun loungers under a grass sun shade. The sand had the consistency of icing sugar and softly scrunched as you walked on it. The sea (the Arabian Sea) was wonderful, it shelved gently and was warm as a bath but with a few waves to make it more interesting. The beach stretched for miles in both directions and there were life guards positioned every 200 metres or so. 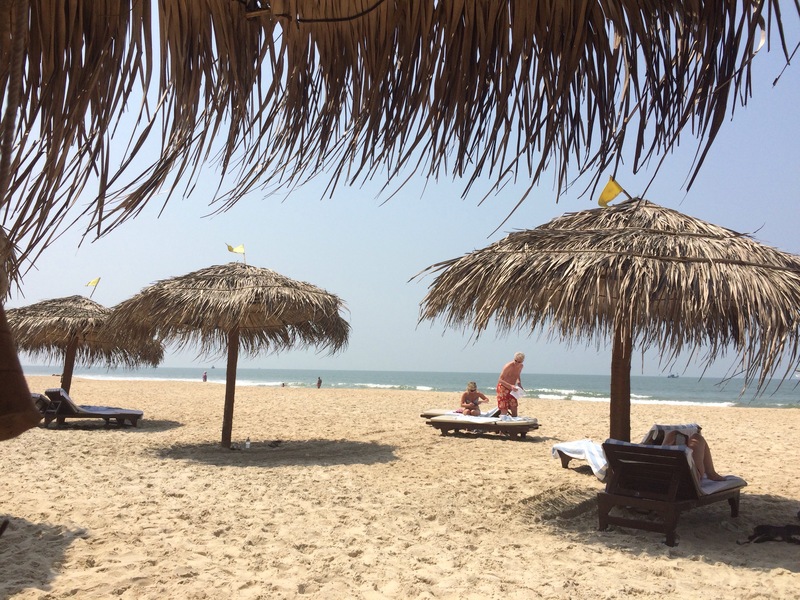 As soon as you walked away from the “hotel” stretch of beach you were accosted by beautiful young girls in colourful saris, selling cheap scarves and bangles. They were friendly and polite but very persistent. We were newbies to the area and they looked so beautiful so we didn’t mind the interruptions. No doubt, by the end of the holiday we would find them extremely irritating. At the end of the day as the sun was setting, we walked along the beach and had supper in one of the many shack restaurants lining the beach. We ate at a table set in the sand under a canvas roof. 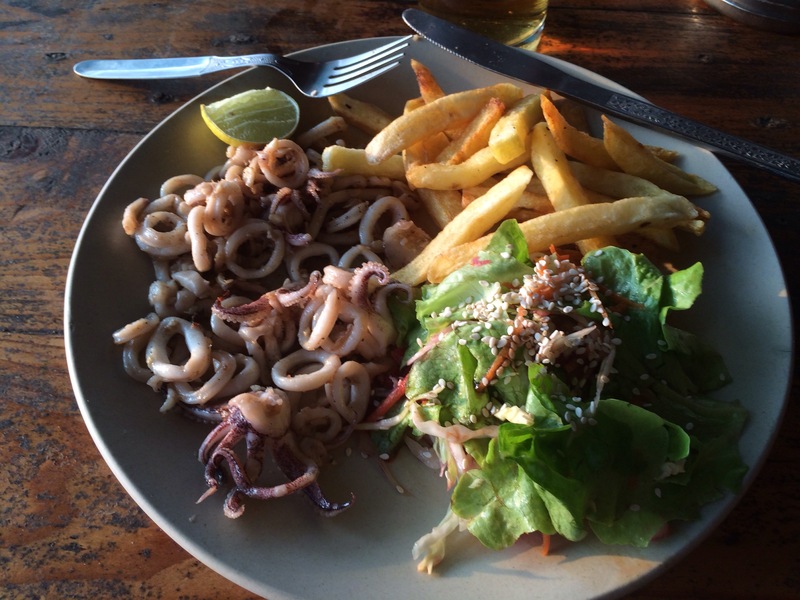 Tony had a fish curry and I had grilled calamari with salad and chips, the whole meal cost £7 for the two of us, including a couple of beers. After the sun had set we walked back along the beach and watched fishermen in a small wooden boat with outrigger land on the beach where there were many hands to haul the heavy vessel above the tide line. 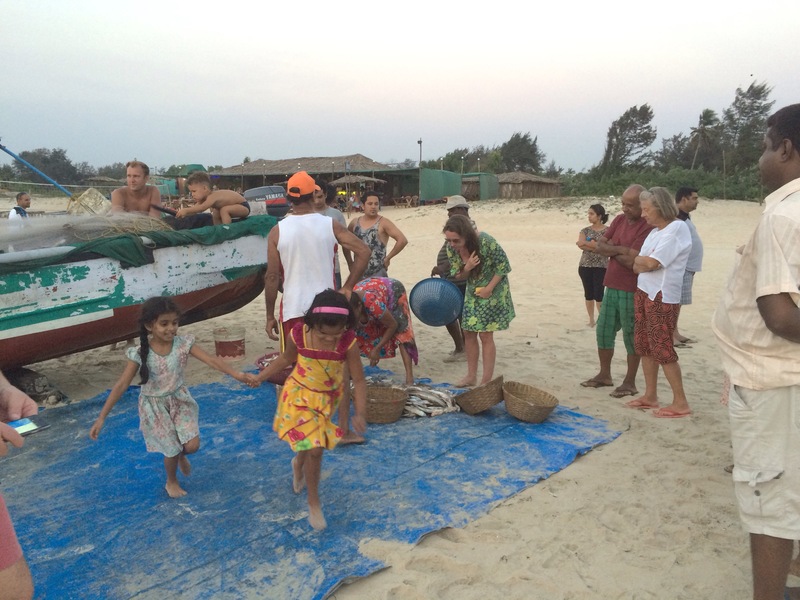 The women folk quickly sorted the silvery fish and the nearby restaurants took the fish to put on their barbecues. We left Heathrow at 9 pm flying overnight with British Airways to Mumbai where we were to change planes for the flight to Goa. 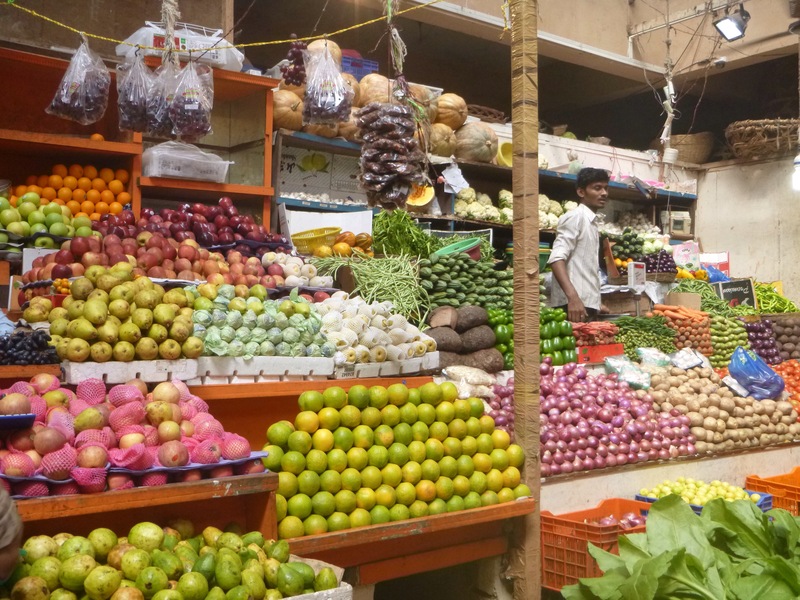 India was five and a half hours ahead of the UK and it was already mid morning when we touched down in a hot Mumbai. We were in possession of a visitors’ visas but the immigration process still took far too long. Each passenger had to be photographed and then their finger prints scanned – the four fingers of one hand, then the other and then the two thumbs. More often than not, one of the three scans failed to register and the whole process had to be restarted. We must have been at the desk for fifteen minutes before they finally gave up trying to record Tony’s sausage fingers and we were finally waved through Passport Control. We took the airport transfer bus from the international airport to the domestic terminal ten minutes drive away. 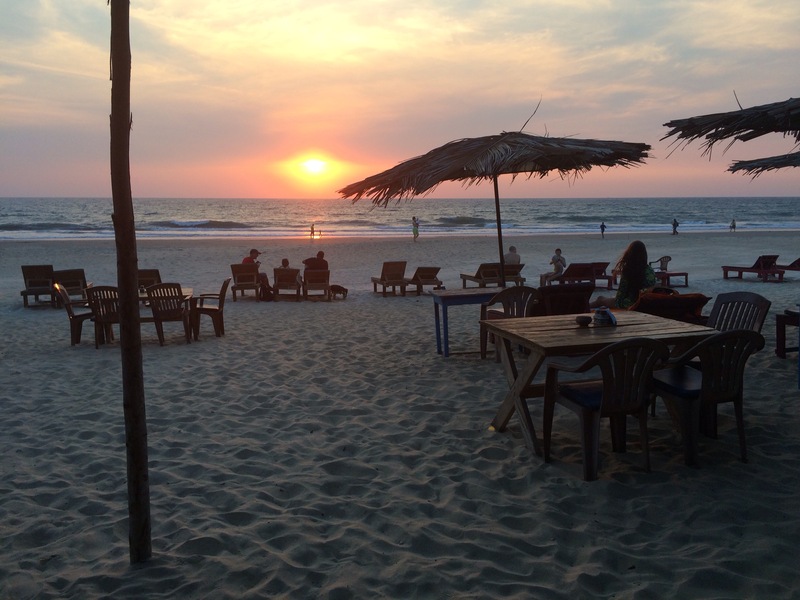 The domestic airport was not air conditioned and was extremely busy – and our flight to Goa was delayed; so we found a crowded bar and had a couple of beers. It was a short 45 minute flight to Goa where we were met by a handsome young man holding a board with our names on. We were soon heading towards our hotel, the Taj Exotica in the quieter south of the country. It was dark by the time we arrived forty minutes later. We were shown to comfortable seats in the huge foyer from where the reception staff carried out the check in procedure. We were given cool hand towels, a fruit cocktail, a flower and a necklace of tiny shells before we were whisked away to our room.